Our official Twickenham hospitality packages offer the finest VIP match day experience at the famed home of rugby. This year, England face their traditional end of season rivals, Barbarians, in the Quilter Cup before heading off to South Africa as part of their 2019 World Cup preparations. In 2017, Six Nations champions England cruised to victory over Barbarians, dispatching them in superb style with a 28-14 scoreline. The win signified a second successive triumph in the cup for Eddie Jones’ men and fans will be eager to see the nation’s finest produce another stellar performance this term. See this superb fixture in fabulous VIP style with our official England Rugby hospitality packages. Sit back and dazzle your valued clients inside our Level 3 restaurant at Twickenham, the home of rugby. Our deluxe England rugby executive hospitality restaurant is located on Level 3 immediately adjacent to the Royal Box. It offers a delightful air of exclusivity as well as outstanding pitch views coupled with exquisite catering. A complimentary bar will also be provided offering the finest premium wines, craft beers and soft drinks. Soak up the breath-taking atmosphere at Twickenham in the comfort of this exclusive private suite and dazzle your valued guests with an unforgettable day of unrivalled Rugby. 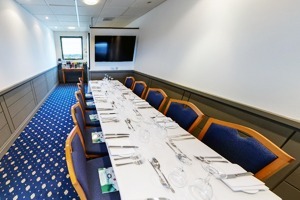 Our luxurious Twickenham hospitality packages offer excellent pitch views combined with superb catering. Don’t miss out on the superb corporate experience at a world-class rugby event. To experience an England International from the West Stand was a once in a lifetime experience. Thank you Eventmasters for making it happen! We have a dedicated page where you can view, download and print all of our event information for the Quilter Cup.